There are many ways to clean various metal products. The three that All America Threaded Products uses include passivation, bright dip, and our new ultrasonic cleaner. Let’s learn more about each process. An ultrasonic cleaner is a tank full of liquid, usually water or a solvent, that cleans items via a very gentle yet effective process. Ultrasonic sound waves are created by a high frequency (20-170 kHz) electronic generator. These sound waves cause the surrounding molecules to vibrate, creating cavitation bubbles. The cavitation bubbles then expand and retract to create powerful vacuum cavities that clean the pieces in the tank. Because these bubbles are microscopic and can get into tiny spaces, items cleaned via ultrasonic cleaner usually don’t need to be taken apart or disassembled. Ultrasonic cleaners can be used to move dirt, grease, wax, oil, bacteria, dust, and more from items including steel, light metals, metals not containing iron, plastic, glass, rubber, and ceramic. The tank is usually heated to between 130- and 170-degrees F. If a cleaning solution is used in the tank, the chemical composition of it will depend on the material being cleaned. Ultrasonic cleaning provides many advantages including speed, accuracy, consistency, automation, and safety. Because solvents do not necessarily need to be used, it can be an environmentally friendly and safe process for cleaning metals. Additionally, the lack of solvents means there are no harmful vapors. The ultrasonic assembly is often very easy to clean and maintain as well. Ultrasonic cleaners provide exceptional cleaning results through a speedy, thorough process. While passivation is most commonly seen with stainless steel, it can be done on other metals. It is a chemical process that removes surface contaminants on the part. The process uses nitric or citric acid to remove surface impurities left over from the fabrication process. Passivation then encourages the formation of a protective oxide layer that helps prevent corrosion. Items must be thoroughly cleaned before passivation. The process is generally controlled by standards such as ASTM A380 and A967 for stainless steel parts. ASTM A380 defines passivation as “the chemical treatment of stainless steel with a mild oxidant, such as a nitric acid solution, for the purpose of enhancing the spontaneous formation of the protective passive film.” It is important to remember the process can be different depending on the material being passivated. Passivated items are typically put through a caustic rinse after the acid bath and are then inspected and tested to ensure performance. Bright dip is another type of polishing process via chemical bath. The bright dip process can usually be done on items made of copper, leaded brass, brass, stainless steel, aluminums, and nickel-bearing alloys. The chemical process polishes the item and then typically adds a layer of corrosion protection. This gives the metals a shiny appearance. The bath used in this process usually consists of a solution of phosphoric and nitric acid. The chemicals in the bright dip bath are hazardous, so safety precautions must be followed. Additionally, the chemical composition of the bath needs to be carefully monitored to produce the correct appearance outcome. Again, the item must first be cleaned to remove all existing surface compounds, oxides, scales, and deposits. The item is then dipped into the bright dip bath. During this process, the acids in the bath react with the metal to smooth out microscopic peaks and valleys on the item. After the bright dip process, there is the option to anodize the item. Anodizing is usually done by dipping the item in sulfuric acid. This creates an oxide layer to help protect from corrosion. The end result of the entire process are metals with a bright appearance, hence the name. 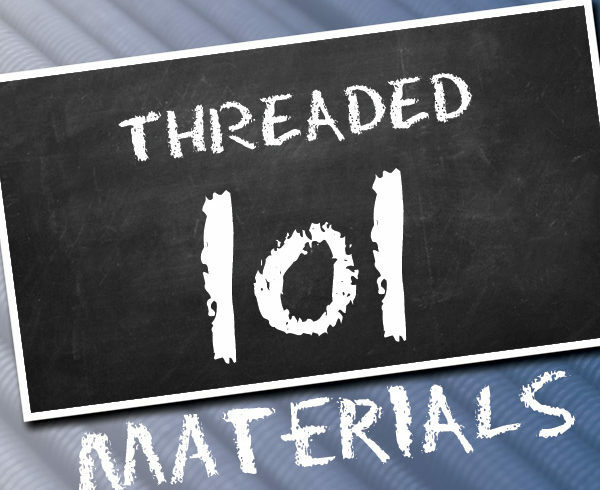 In the latest installment of our Threaded 101 series, we discuss materials used to make threaded rod and which work best for certain applications. In the latest installment of our Threaded 101 series, we discuss threaded rod finishes and identify which work best for certain applications. In this series, we will be covering four common topics to help you build the foundation you need to better understand the threaded fastener industry.